MANOWAR – The “Gods And Kings World Tour 2016” will be equipped with 300,000 Watts for bombastic sound and over 150 m² of high-resolution 6k LED panels for visual indulgence. 4 weeks ago we played the last show on the January 2015 leg of our tour. Countless unforgettable moments that will forever be immortalized in our memories. Check out the Facebook album “Kings Of Metal MMXIV World Tour – January 2015”. 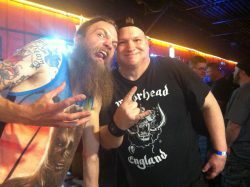 The power and persistence of the American Manowarriors has prevailed! Tickets will go on sale on November 29, 2013 (Black Friday). “We are excited to tour on American soil again! Our American fans have loyally stood with us, united as one. Many of them have traveled across the continent and even to Europe to celebrate with us. These shows will be unforgettable, massive feasts of True Metal with everyone’s favorite MANOWAR hymns!” said bassist Joey DeMaio. 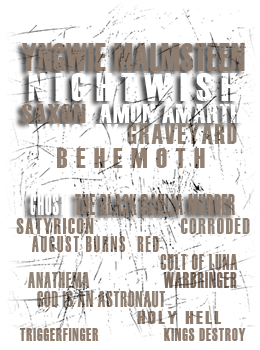 As a tribute to the special anniversary, MANOWAR will perform the full “Kings Of Metal MMXIV” album along with a “best of” set of other immortal metal hymns. MANOWAR’s “Kings Of Metal” album, a milestone in Metal history, was first released on November 18, 1988, followed by a world tour in 1989. 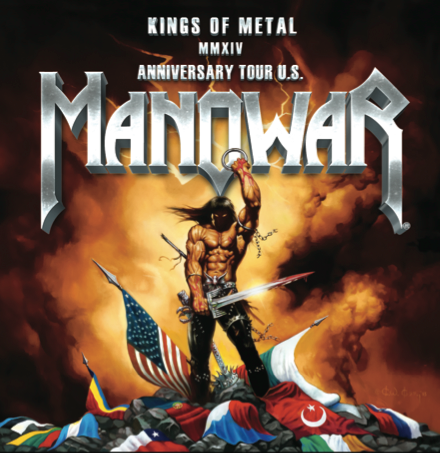 In celebration of the 25th anniversary of these events, MANOWAR will release a brand new special version of the album, “Kings Of Metal MMXIV”, followed by the “Kings Of Metal MMXIV” World Tour. Many more tour dates will be revealed soon. MANOWAR’s “Kings Of Metal” album, a milestone in Metal history, was first released on November 18, 1988. Already a significant force with international success since their debut album “Battle Hymns”, this release and the following 1989 “Kings Of Metal” world tour catapulted MANOWAR to a new sphere. Songs like “Heart Of Steel”, “Kings Of Metal”, “Hail And Kill” and “Blood Of The Kings” became instant anthems and remain among the most demanded songs in concerts, celebrated not only by MANOWAR fans. In celebration of the 25th anniversary of “Kings Of Metal”, MANOWAR are currently in the studio, recording a brand new special version of the album: “Kings Of Metal 2014”. The new rendition will “honor the original as it’s inspiration, but with additional energy, fully utilizing the power of today’s technology and 25 years of experience, and it will contain new arrangements and changes that incorporate live performance elements added over the years” said MANOWAR bassist Joey DeMaio. “The album will feature additional bonus material and many other surprises,” he added. The new recording is only one component of the “Kings Of Metal 2014” anniversary celebration. For this special occasion, MANOWAR will also open their vaults and reveal never-before-seen video footage, photos, behind-the-scene interviews and insight into the history of MANOWAR and the “Kings Of Metal” era. For the new narration on “The Warrior’s Prayer” the band will be joined by celebrated British actor Brian Blessed (“Henry V”, “Macbeth”). Mr. Blessed is a renowned Shakespeare and character actor who has starred, among others, in Kenneth Brannagh’s “Henry V” and “Much Ado About Nothing”, in “King Lear” and Oliver Stone’s “Alexander”. 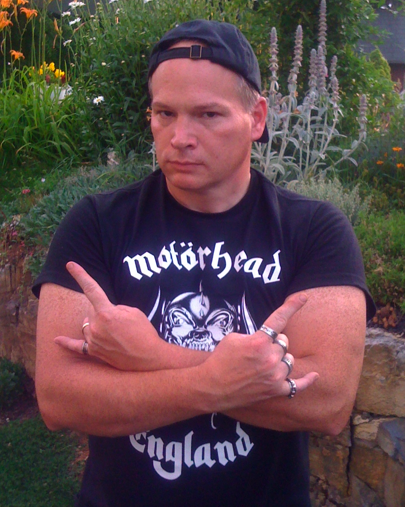 Brian also has an affinity with Heavy Metal music. In June 2013 he received the “Spirit of Hammer Award” at Metal Hammer UK’s Golden Gods Awards. The new recordings will also feature guitarist Karl Logan’s and drummer Donnie Hamzik’s contributions, who, after having played these classic hymns many times live, will now have the opportunity to add to their legacy by including their own signature sound and performance. The release of “Kings Of Metal 2014” is scheduled for the end of this year. 2014 will then see MANOWAR’s anniversary tour, performing the full “Kings Of Metal 2014” album along with their other metal hymns in a completely new stage production. The album will be mixed and mastered at MANOWAR’s own studios Hell and Haus Wahnfried by Joey DeMaio personally with long time MANOWAR engineer Dirk Kloiber. 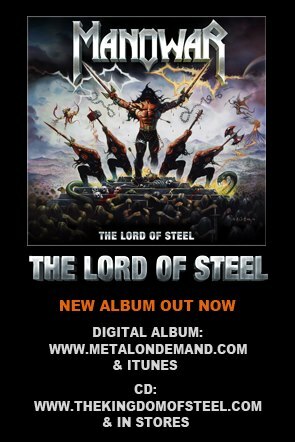 ‘The Lord Of Steel Live’ will be released digitally as an iTunes exclusive worldwide on July 9, 2013 and on CD in retail and through www.thekingdomofsteel.com on August 16, 2013. * For more info on MANOWAR, click on the links below! MANOWAR – Will Perform On German Cult TV Show “TV Total” – New Album “The Lord Of Steel” Is Out Now! MANOWAR will return to Germany’s cult show ‘TV Total’ on October 30 and reunite with TV Total host and entertainer Stefan Raab. 2012 not only marks the 10 year anniversary of MANOWAR’s hit album ‘Warriors Of The World’, but also the band’s last visit on TV Total and Stefan’s memorable performance during the Warriors Of The World Tour. 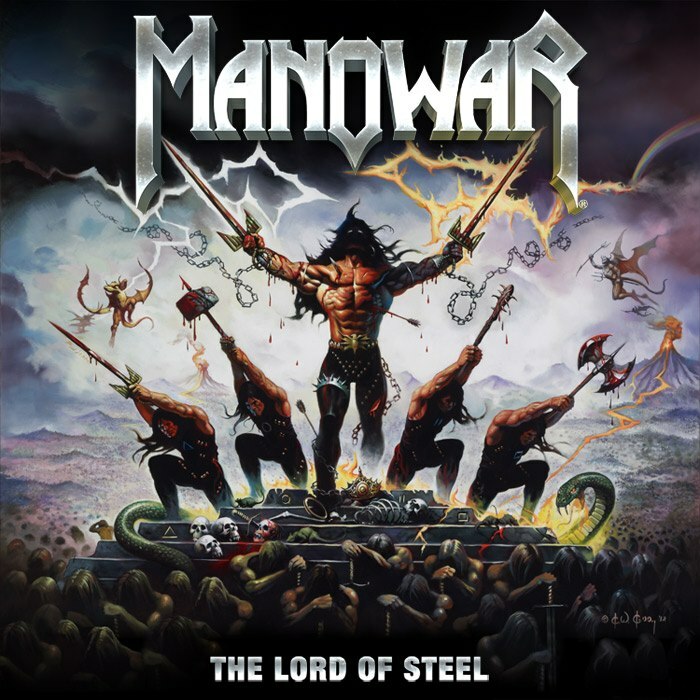 MANOWAR will perform ‘Touch The Sky’ live, a track from the new album ‘The Lord Of Steel’ that is now available in stores and on iTunes worldwide. The show will be aired on October 30, 2012 at 11:10PM CET on Pro7. 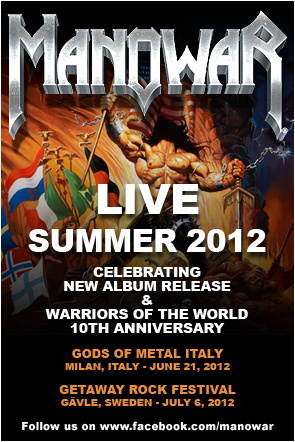 MANOWAR – As the above poster states, MANOWAR will be having quite a Metal glorious Summer of 2012!